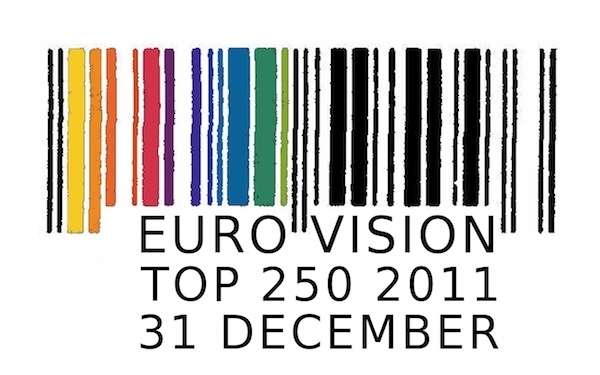 Yesterday, ESC Radio broadcasted the ESC Top 250. For a month, between November 24 and December 20, Eurovision fans had the opportunity to vote for their favourite entries from the entire history of the Eurovision Song Contest. The voting was organized in collaboration with 12.points.tv, BlogIlkar, escradio, Belgovision.com, OGAE.nl, Infe Network, Eurovisionfanclub.gr, and Songfestivalweblog. It is remarkable that there are so many songs in the list of the ESC 2011. In the list I miss some songs of the 60s, 70s and 80s. 6. Poland 1994: Edyta Górniak - To nie ja! 7. Iceland 2009: Yohanna - Is It True? 33. Hungary 2011: Kati Wolf - What About My Dreams? 86. Greece 2010: Giorgos Alkaios and Friends - OPA! 119. Hungary 1994: Friderika Bayer - Kinek mondjam el vétkeimet? 157. United Kingdom 1998: Imaani - Where Are You?